Josie d’Avernas is the executive director of the Schlegel-UW Research Institute for Aging (RIA) at the University of Waterloo, an innovative partnership of 19 long-term care and retirement communities, the University of Waterloo and Conestoga College. The institute enhances the quality of life and care for older adults through interconnected programs in research, education and practice. Josie is an expert in knowledge mobilization – the process of enriching the connection of research, policy and practice – for seniors’ living and care. She has led projects in strategic planning, training, facilitation, policy analysis, literature synthesis, knowledge transfer, evaluation and research. Prior to joining RIA, she worked for more than two decades in health promotion and tobacco control through her consulting firm, Health Promotion Consulting, engaging with clients that included the National Cancer Institute of Canada (Canadian Tobacco Control Research Initiative), the Canadian Cancer Society, Health Canada, the Department of National Defense and Corrections Canada. 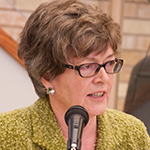 A recipient of the Heather Crowe Award and the Mary Jane Ashley Award for Lifetime Outstanding Achievement in tobacco control, Josie has authored scholarly articles on investments in heart heath, fostering smoke-free workplaces and coordinating smoking cessation programs.